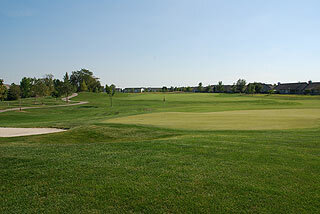 Wildcat Creek Golf Course in Kokomo is a Jerry Matthews/Jim Fazio design with bentgrass fairways, tees and USGA greens. This layout, which traverses a fairly level terrain through an upscale residential community, is one of the area's best values - and is conveniently located off highway 31, just 25 minutes from Indianapolis. Golfers will encounter some of the best conditioning from tee to green available in the region! 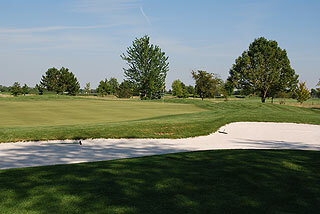 Significant bunkering is featured in the topography, but most of the sand traps are non-penal in nature, with low lips that provide opportunities for saves and recoveries. 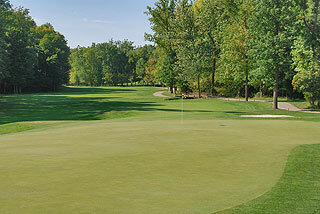 The green complexes themselves are quite forgiving, with putting surfaces that are mild in slope and true rolling. Understated mounding and collection areas provide good up and down opportunities, with the bump and run technique a good option from the open fronts. 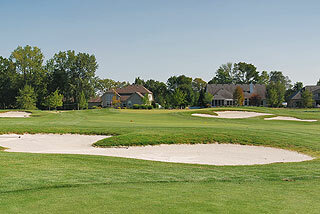 Fairways are generally wide, with many open landing areas on the front side. The par four 4th is a beautiful hole, with water along the left discouraging cuts on this dogleg left design. 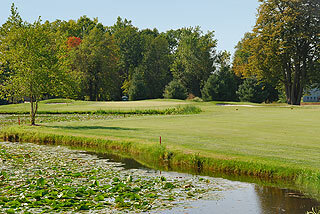 Number seven is a gorgeous par three that plays from an elevated tee to a well bunkered green. 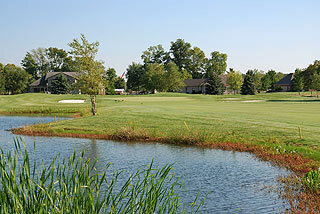 The back side is more tree lined, with some tight fairways bordered by forest on both sides. The beautiful par four 11th turns sharply right about 100 yards out, with a tee shot along the left side setting up the best approach. A creek intersects the fairway on 12 off the tee, with 60 yards of fairway available before the hazard again traverses across. 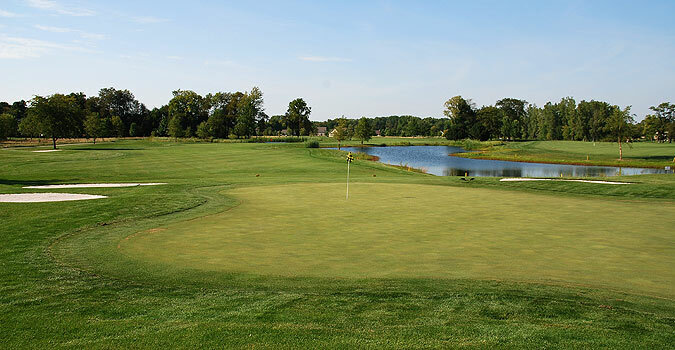 Numbers 16-18 provide the best stretch of the course and can make or break a round. The 16th and 17th are tight and tree lined, and the finishing hole features a pond short right and long left which affect the tee shot and approach. 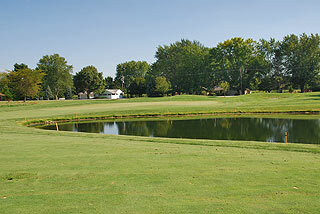 Photos from the tee and behind the green are pictured below. Five sets of tees provide golfers with opportunities to play from distances and slopes that measure 6882 yards/136 slope, 6406 yards/132 slope, 5866 yards/1127 slope, 5410 yards/122 slope and 5219 yards with a slope of 125 for women. We recommend the blue tee areas for the average player, as the longer par fours provide ample room, and are good grip it and rip it holes. On course yardages are marked on sprinkler heads and stakes on both sides of the fairways indicate 100, 150 and 200 yards. Pin placement sheets are provided and hole diagram booklets with playing tips are standard on each cart. Unique to this course - divot repair containers are situated on the fairways of all par fours and fives - there is no excuse for not repairing divots! On property is a full service practice facility with spacious grass range, 2 large putting greens and a short game area with sand bunker. The clubhouse includes a small pro shop with attire and golf accessories, plus a snack area/lounge with hot and cold sandwiches. Banquet/outing facilities are also available. This is a wonderfully conditioned golf course - the folks here obviously work hard to make sure your experience here is enjoyable. 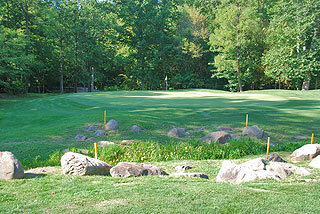 It is easy enough for beginning golfers, and is challenging enough from the two back tees for experienced players. For more info, visit our page for Wildcat Creek with direct link to their website by clicking here.